This Rossini rarity is described (rightly) as an opera semiseria. It was adapted from a French play with a tragic ending that tells of a servant girl accused of stealing silverware; the penalty for such a crime (the firing squad!) seems disproportionate. Only too late is it discovered that a thieving magpie had nabbed the shiny objects. Rossini and his librettist gave the tale a happy ending - but there are many tribulations along the way. Director Peter Kazaras and set and costume designer Myung Hee Cho have taken a cue from the fact that the magpie is played by an adult female human and have devised a world where everyone is to some degree avian, thus giving the production a surreal edge. The plot features characters of differing (and clashing) social standing. Ninetta, the put-upon servant, sports a few small feathers in her hair. The higher up the social scale, the more effulgent the feathered garb. Lucia, the girl’s accusatory mistress, and the opportunistic podestà (mayor) who tries to take advantage of her (see photo above) seem to be inspired by Mark McKinney’s demented Chicken Lady. A few excisions have been made to the score to keep the running time, with one interval, to three hours. The work is still a bit too long for its content but the lively production keeps one amused. Meg Gillentine in the title role actually starts her performance on the festival grounds as the audience files in, and there is a lot of stage action during the lengthy overture. The performers have a lot of notes to sing and there are places where the hard work shows. 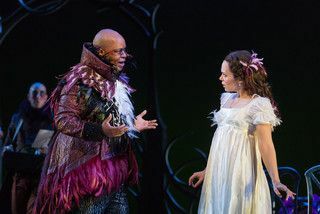 The central role is that of Ninetta and Rachele Gilmore gives a fine display as to what a high coloratura soprano can do with the part which, like so many Rossini roles, can be adapted to other vocal types. Her stalwart if ineffectual boyfriend (and son of her accuser), Giannetto, is performed by Michele Angelini who has a warmer and softer-grained tone than we have come to expect in a bel canto tenor, of which there is currently a healthy crop. He could be on the cusp of great things. Musa Ngqungwana gives a vivid portrayal of the predatory mayor. Dal Travis, as Ninetta’s hapless father, Fernando, is vocally hard-pressed at times, a factor that arguably suits the role. As usual, the festival’s Young Artists take on several roles. The trouser role of Pippo, Ninetta’s lively friend, is brilliantly delivered by Allegra De Vita who seems to be having the time of her life (and Pippo is the one who eventually solves the mystery). Leah Hawkins is in fine vocal and dramatic form as the accusatory rich lady, and Calvin Griffin in the more sympathetic role of her husband, Fabrizio. Brad Raymond ably does double duty as the peddler, Isacco and the frantic jailer, Antonio. The chorus is assigned a full aviary’s worth of crazy business. 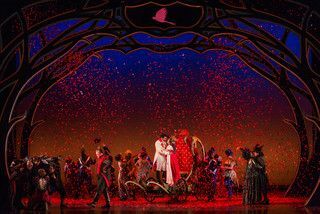 The festival’s Music Director, Joseph Colaneri, keeps things ticking along nicely, and the glittery finale (above) brings the delighted audience to its feet. In 2017 Glimmerglass will deliver yet another bel canto rarity, Donizetti’s L’assedio di Calais (“The Siege of Calais”).